C# Split() handles splitting upon given string and character delimiters. It returns an array of String containing the substrings delimited by the given System.Char array. 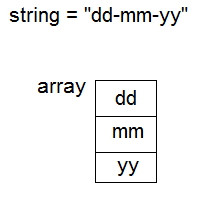 If your String contains "dd-mm-yy", split on the "-" character to get an array of: "dd" "mm" "yy". The String Split method ignores any element of separator whose value is null or the empty string (""). An array of Strings delimited by one or more characters in separator. The Regular Expressions Split() methods are almost similar to the String.Split() method, except that Regex.Split() method splits the string at a delimiter determined by a Regular Expression instead of a set of characters. When using Regular Expressions you should use the following namespace in your project. We can split a string by multiple character delimiter using String.split() method. You can split a string on a new line or carriage return using the delimiter "\r\n". You can retrieve the result of a String splt() method to a C# List. The following program convert the String Array to a List. StringSplitOptions.RemoveEmptyEntries guarantees the return value does not include array elements that contain an empty string. The following C# program shows how to remove all white spaces from string using StringSplitOptions.RemoveEmptyEntries.